Four Mints, Four Finishes, One Amazing Vision of Lady Liberty! That evolution still continues today. With 2017 heralding its 225th anniversary, the United States Mint celebrated the momentous occasion by introducing the Gold American Liberty Proof. 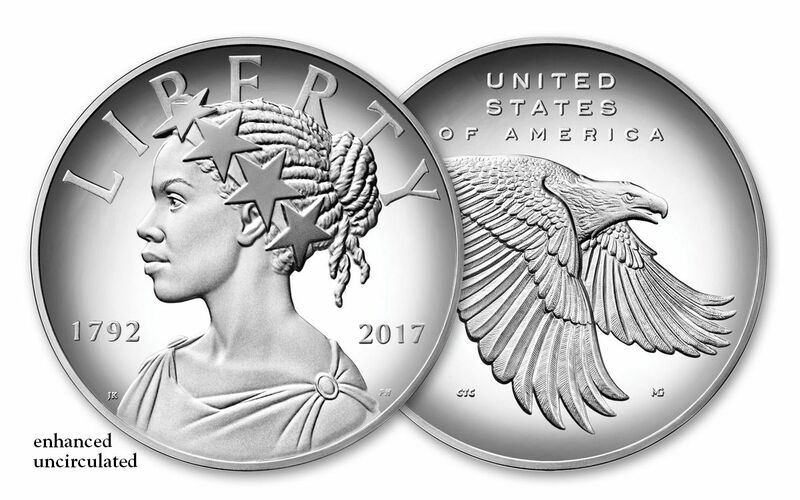 Featuring a new artistic interpretation of Lady Liberty, this critically-acclaimed coin became a media event well before its release. 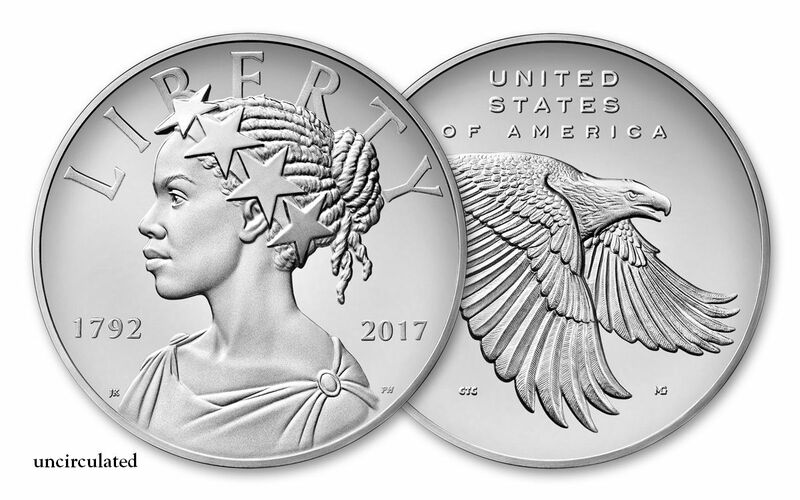 Hot on the heels of that popular release was its shining silver counterpart -- the 2017 1-oz Silver American Liberty Medal. 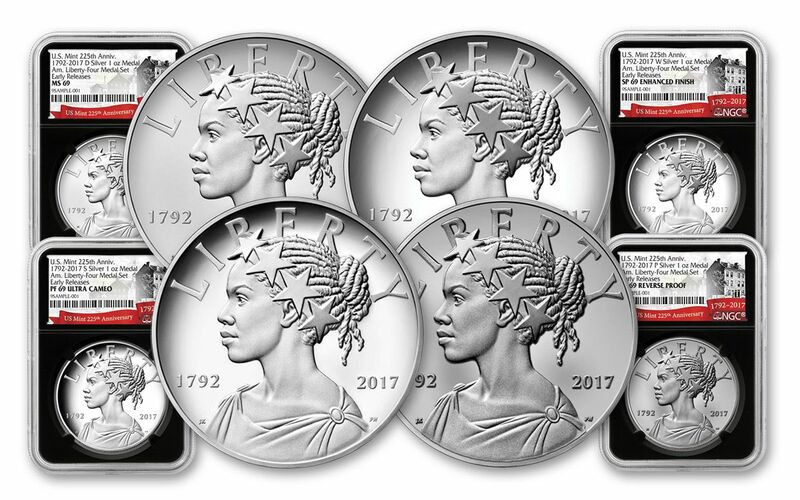 Now, to help cap off a year of amazing releases, this new set features four different versions of the Silver American Liberty Medal, one from each of the four United States Mints! A HISTORIC DESIGN -- These gorgeous medals mark the U.S. Mint's anniversary in addition to serving as the first silver medal of the American Liberty biennial series -- imagining Lady Liberty through the prism of our nation's cultural and ethnic diversity. Like its golden predecessor, Liberty is portrayed as a beautiful African-American woman, wreathed with stars reminiscent of Thomas Crawford's "Statue of Freedom" that graces the top of the U.S. Capitol building. 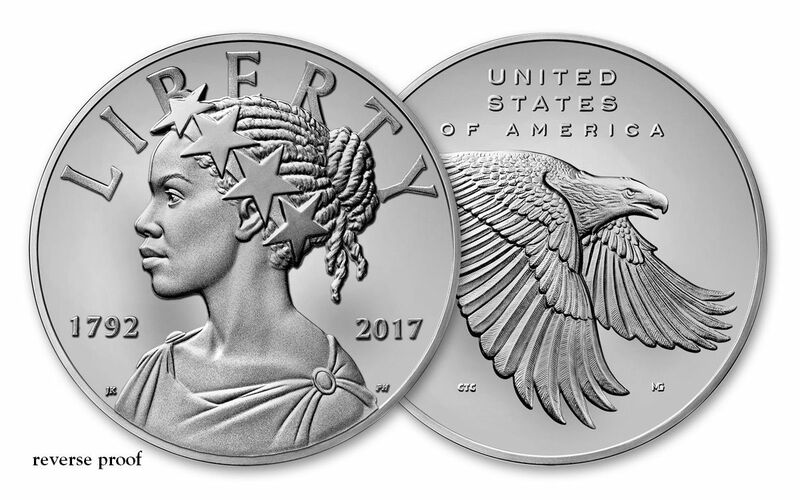 A DISTINCT DIFFERENCE, MINTED IN HIGHLY PURE SILVER -- The most notable design difference of this silver medal from the gold proof is a taller, fuller portrait of Liberty. Since this silver medal is not legal tender, the mandated inscription of "In God We Trust" has been removed in order to bring Lady Liberty's profile all the way down to the rim. Joined with a crisply-detailed interpretation of a bald eagle on the reverse, each proof is minted in one ounce of 99.9% fine silver. A MEDAL FROM EACH MINT -- This incredible set also unites all four coin-producing facilities of the U.S. Mint, each contributing a version of the silver medal that showcases their renowned specialty. The artistry of the Denver Mint (Uncirculated), San Francisco Mint (Proof), West Point Mint (Enhanced Uncirculated) and Philadelphia Mint (Reverse Proof) is on full display with each mint's medal serving as a superb example of a different finish, punctuated by the particular mint's distinctive mark. ALL CERTIFIED NEAR-FLAWLESS -- Your Uncirculated Medal will come certified Mint State-69 (MS69), your Enhanced Uncirculated Medal will come certified Specimen-69 (SP69) and your Proof and Reverse Proof Medals will come certified Proof-69 (PF69) by Numismatic Guaranty Corporation (NGC). These distinctions mean that all four almost-flawless 2017 1-oz Silver American Liberty Medals showcase impressive full strikes and indistinguishable imperfections. In addition, your medals will be certified Early Releases (ER) by NGC, meaning that they were among the first struck by the mint and were verified within the first 30 days of issue. Your medals will also arrive individually sealed in their own protective acrylic holders with distinctive black core inserts, each with a special 225th anniversary label. Finally, your medals will be accompanied by a United States Mint booklet that charts the history of Lady Liberty. A LIMITED MINTAGE EVENT -- Only 50,000 of these sets will be issued, making this set one of the United States Mint's most limited of the year! 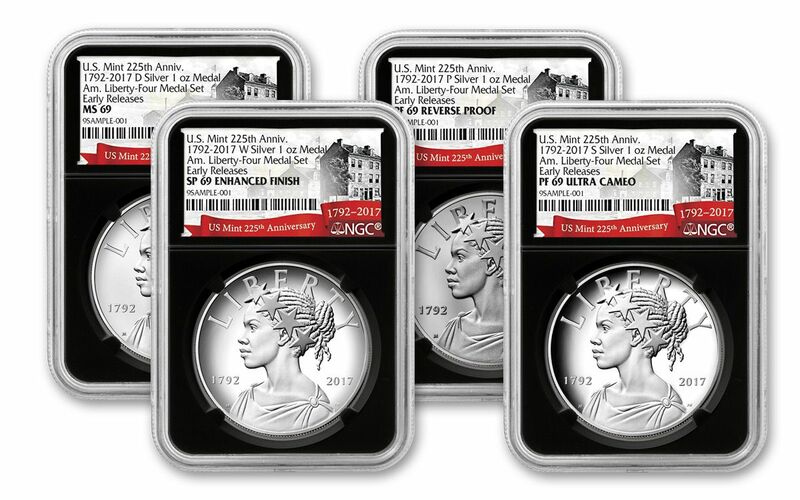 Like the gold and silver proofs that came before it, this 2017 American Liberty Silver Medal Set is attracting collectors from around the world. As a perfect companion to the series' previous proofs or as a symbol of America's cultural and manufacturing diversity, this set is a collection essential. Don't miss out on this historic opportunity -- add this sublime silver vision to your cart now!